May 28, 2017 - Like us now! 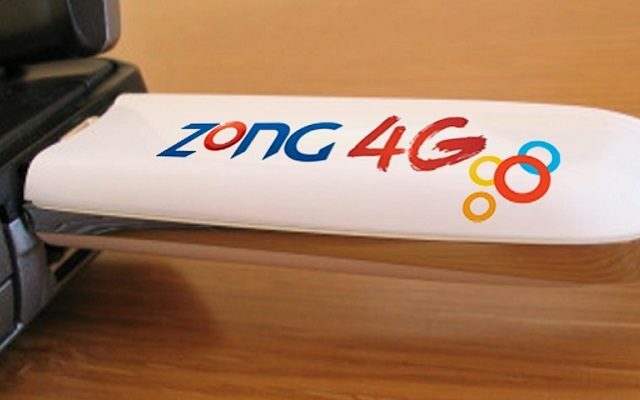 Today we are going to take a look at Zong Device Packages including the packages of Zong 3G devices and Zong 4G devices. Zong or China Mobile Pakistan (CMPak) is a 100% owned subsidiary of China Mobile Communications Corporation. Zong engages in the provision of cellular mobile voice and data services to the Pakistani market through 2G, 3G and 4G technologies. We have already told you about Zong Call Packages, Zong SMS Packages, Zong 3G & 4G Internet Packages, Zong Internet & MMS Settings, Zong Advance Balance Code and Zong Balance Check Code. Let’s talk in detail about Zong Device Packages: 3G/4G Dongles, Wingles & MiFi. Zong device packages include a diverse range of 3G and 4G dongles and devices at different prices. Zong 3G Devices include Zong Super 3G MiFi, Zong Super 3G Dongle and Zong Super 3G Wingle. The details about various monthly, 3-month, 6-month and 12-month internet packages/bundles are given in the end. Users can enjoy super-fast 3G with Zong SUPER 3G Mifi device. It is a pocket-sized router on the go that can support up to 10 devices. The device has a built-in rechargeable battery. Battery time is up to 6 hours. With Zong Super 3G wingle users can surf on the go. It connects almost 10 wifi devices. Just plug in your wingle in any USB power source and enjoy the flaming fast Zong Super 3G network. The device has a customized software to fulfill customer needs. Zong offers you 4G Mobile Wifi, combining speed and convenience like never before. With speeds up to 150 MB on the go. Get blazing speed anywhere you need. 4G Mobile Wifi is a portable device which acts as a mobile hotspot and connects up to 10 users. Zong 4G Bolt (Huawei) is a USB modem with built-in Wi-Fi router which plugs into your laptop, PC or any power adaptor having a USB port. It can support up to 10 multiple internet connections simultaneously and does not require any drivers, you just need to plug the device into the USB port and it will connect automatically to Zong 4G network. Just plug in your wingle in any USB power source (laptop, USB plug etc) and connect with the blazing fast Zong 4G LTE network. Fastest portable internet device available in Pakistan with speeds of up to 150 Mbps. Zong 4G Bolt (Fiber Home) is a USB modem with built-in Wi-Fi router which plugs into your laptop, PC or any power adaptor having a USB port. The device operates just likt the 4G bol from huawei. It is only from the different company. It can support up to 10 multiple internet connections simultaneously and does not require any drivers, you just need to plug the device into the USB port and it will connect automatically to Zong 4G network. The discounted price for the device when self-picked is Rs. 2,600. 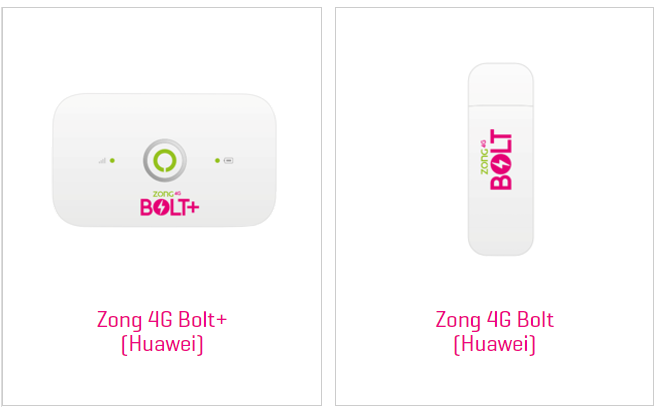 Zong 4G Bolt+ (Huawei) is a pocket-sized wireless modem with combine functionality which allows you to create your own personalized internet hotspot with true mobility. It can support up to 10 multiple internet connections simultaneously providing the internet at blazing speed on Zong 4G network. Battery 6 Hours working time, 300 Hours standby (Network Dependent). Zong 4G Bolt+ (Fiber Home) is a pocket-sized wireless modem with combine functionality which allows you to create your own personalized internet hotspot with true mobility. It comes with a digital screen which shows information about the battery, signal strength, the network you are connected to (2G/3G/4G) and the number of devices connected to it. It can support up to 10 multiple internet connections simultaneously providing the internet at blazing speed on Zong 4G network. You can visit your nearest CSC/Franchise or a retailer nationwide in 3G/4G cities to avail Zong device packages. The master number is your mobile number, you can get usage notifications on this number and also if your master number is Zong number then you can also subscribe bundles and recharge for your MBB number. You can dial *6767# from your Master number or *6363# from your MBB number device interface i.e. 192.168.8.1 and Subscribe or Unsubscribe any bundle. Dial *102# from MBB Number or use Zong device portal 192.168.8.1 to know the consumption/usage of your internet bundle. All prepaid, and postpaid individuals can use these plans. How to recharge your Zong MBB Devices? You can recharge using their debit/credit card online (http://www.zong.com.pk/zong-recharge/online-recharge-bill-payment ). Please enter the MBB number on the portal and follow the guidance to recharge. The customer can access Zong Mobile Broadband device portal by connecting device to laptop/PC/Power source, the portal page will pop-up. In the case of delay, type 192.168.8.1 in URL or Address bar to access portal. Insert the MBB SIM back in the Zong Mobile broadband device to use High-speed Data services. A ZONG SIM will be paired with MBB SIM and in order to enjoy free resources on ZONG SIM, customer has to continue subscribing to MBB bundles. In order to avail FREE ZONG SIM (i.e. Plus ONE SIM) customer will have to visit nearest ZONG CSC, Franchise or Retailer. Plus ONE SIM will be issued on the same CNIC on which MBB Device is registered. To check whether you’re eligible for this offer simply dial *9# from any ZONG SIM and enter your MBB number or send your MBB Number in SMS to 6555. That was all about Zong Device Packages for Zong 3G/4G Devices. If you think we missed something or if you want us to do research on something particular please mention in comments below. Otherwise, our comprehensive research on the pricing details of call, SMS, internet packages and isettings, advance balance codes of Telenor, Ufone, Zong, Jazz and Warid can be viewed here.